Right Technology to Control IT Costs | PC.Solutions.Net . : We make nets work! :. You are about to get the Ultimate Guide to Choosing the Technology to Control IT Costs for good. 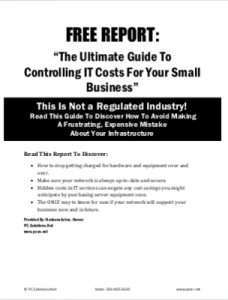 Every business owner, like yourself should read this report before making a decision about IT infrastructure. I’m providing this report free of charge for a limited time. You’ll be able to immediately download the report after you submit this form. Submit form above to download report instantly! Not all systems are created equal! Read this guide to discover how to avoid making a frustrating, expensive mistake when choosing the technology for your computing infrastructure. Important: We HATE spam as much or more than you do and we will not rent, share, or sell your information with anyone ever! We will only use your information to communicate with you directly, and you can remove yourself from our list any time with one simple click. Copyright © 2002 - 2019, PC.Solutions.Net. All rights reserved.